to Antarctica’s Ross Sea region. 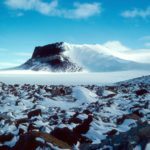 DeKALB, Ill. — Scientists generally have believed that since the end of the last Ice Age, about 15,000 years ago, the West Antarctic Ice Sheet (WAIS) has been getting smaller and smaller, with its retreat triggered by a warming world and sea-level rise from collapse of Northern Hemisphere ice sheets. A study published online June 13, 2018 in the journal Nature shows a more complicated history. Surprising new data and ice-sheet modeling suggest that between roughly 14,500 and 9,000 years ago, the ice sheet below sea level partially melted and shrunk to a size even smaller than today—but it did not collapse. Over the subsequent millennia, the loss of the massive amount of ice that was previously weighing down the seabed spurred uplift in the sea floor—a process known as isostatic rebound. Then the ice sheet began to regrow toward today’s configuration. Don’t count on isostatic rebound, however, to be a panacea for modern-day rising sea level, he added. 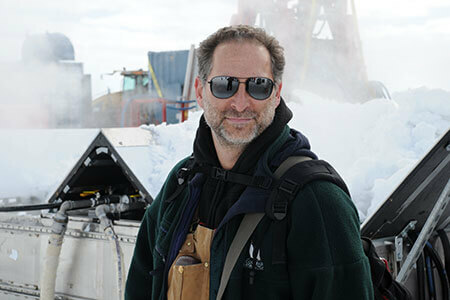 Scherer is one of three lead authors on the study, along with Jonathan Kingslake of Columbia University’s Lamont-Doherty Earth Observatory and Torsten Albrecht of the Potsdam Institute for Climate Impact Research in Potsdam, Germany. The scientists were carrying out independent investigations that took different routes to the same conclusion of past grounding-line retreat and advance. “We were all working in parallel, saw each other’s results at conferences and decided to combine our efforts,” Scherer said. Scientists studying climate change and sea-level rise are keenly interested in the future behavior of the WAIS. It is the last ice sheet on the planet resting in a deep marine basin and is the most likely player in any future, rapid sea-level rise. 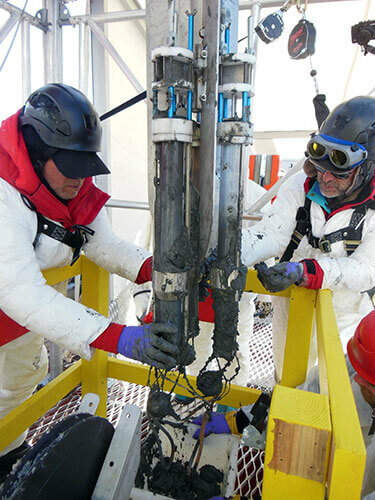 Scherer’s team analyzed sediments recovered from beneath a grounded area of the WAIS in the Ross Sea region. The area was thought to be covered by grounded ice since the last Ice Age, 20,000 years ago. 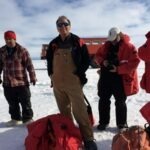 But the scientists were surprised to find marine organic material containing radioactive Carbon-14 in the sub-ice sediments, indicating that it was connected to the ocean much more recently than anybody thought. The WAIS, they concluded, had retreated more rapidly and much more extensively than had been previously documented, with the grounding line (where ice, sea and the sea floor meet) pulling back more than 200 kilometers beyond the current position, before re-advancing toward its present position about 1,000 years later. Meanwhile, Kingslake and a colleague conducted ice-penetrating radar observations of grounded ice on the other side of the WAIS, in the Weddell Sea region. They discovered many buried features within the ice sheet, interpreted as relic crevasses that had later filled with marine ice. These and other ice features were consistent with past ocean melting and floating ice—as well as a grounding line that had receded since the last Ice Age well inland of today’s margin. Finally, Albrecht and a colleague conducted sophisticated numerical ice-sheet modeling driven by the warming climate and rising sea levels after the last glacial maximum. 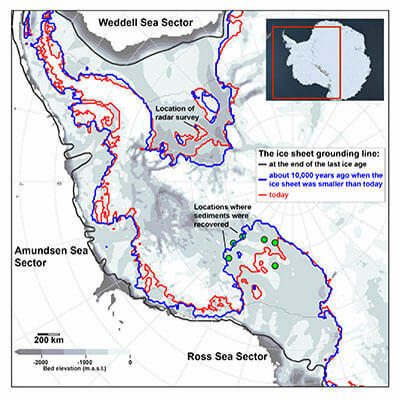 Those simulations show ice sheet retreat before reaching a turning point, with the grounding line up to 200 kilometers inland of its present day location in the Weddell Sea region and up to 400 kilometers in the Ross Sea region. Curiously, the ice modeling did not find grounding-line retreat and rebound-driven re-advance in the Amundsen Sea region, where present-day grounding-line retreat is causing concern about future runaway collapse. 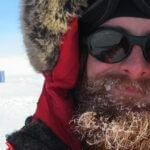 Other authors on the study include: Jason Coenen, Ross Powell, and Nathan Stansell from Northern Illinois University; Ronja Reese from the Potsdam Institute for Climate Impact Research; Slawek Tulaczyk from University of California Santa Cruz; Martin Wearing from Lamont-Doherty Earth Observatory; and Pippa Whitehouse from Durham University, UK. The research is funded by the Natural Environmental Research Council (NERC), Deutsche Forschungsgemeinschaft (DFG) and U.S. National Science Foundation (WISSARD project).